The Minnesota Beet Sugar Manufacturing Company was incorporated on May 10, 1897. In 1897 it took over the site of the Minneapolis Esterly Harvester Company and changed its name to the Minnesota Sugar Company. It was the first sugar beet plant to be built in the upper Midwest, and employed 450 men in 1899. The plant was built by Dyer and Kilby, and the first sugar was refined in 1898. It could process 350 tons of sugar beets per day. The company persisted in dumping its refuse in Minnehaha Creek, but nobody could come up with the money for a sewer. The site’s 36-acre location was on the future 80-acre site of the Creosote plant, which was generally south 32nd Street, north of Walker Street, west of Gorham and Republic, and east of Pennsylvania Ave. There may have been worker houses built by the company. The plant was heavily damaged by the tornado of August 28, 1904. The plant was wiped out by fire on May 2, 1905, with a loss of $400,000. The fire “started in the laboratory over the office in the west end of the building. D.W. Rocking, chemist, discovered the fire at 1:30 am,” reported the Minneapolis Tribune the next day. Rocking had gone to dinner at about 12:30 am and returned to find the rafters smoking. A bucket brigade was formed from the Village to no avail. The Minneapolis fire department made the arduous journey to try to help, but the fire “seemed to laugh at them and their efforts to conquer… The fire had its start and simply ate away, practically unhampered until everything had been reduced to ashes, crumbling walls, and twisted machinery.” Water applied to the fire was merely reduced to steam or thrown back by the power of the flames, which moved “upwards, outwards, and sideways.” 12 miles of copper tubing were ruined, and a locomotive was “now a warped and torn piece of junk – absolutely worthless.” Only a few buildings were saved, including a storage building holding hundreds of tons of molasses. The Tribune also noted that Villagers came from all around to see the fire and got in the way of the firemen, with no police to direct traffic. The company had contracted for 3,300 acres of sugar beets to process, and had sold thousands of pounds of sugar ahead on contract. 200 men were put out of work for the season, which started on October 1 and ran for four months. The plant was replaced by a site in Chaska in 1906, which was acquired by the American Crystal Sugar Company in 1925. Republic Creosote took over the St. Louis Park site in 1917. 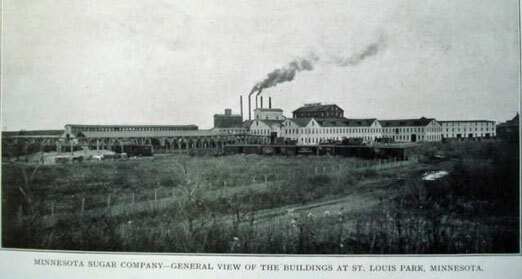 The St. Louis Park Sugar Processing Plant was constructed in 1898 during a period which might appropriately be called a “heyday” in terms of the number of plants which were constructed. In fact, between 1897 and 1900, twenty-nine sugarbeet plants were built in the United States reflecting perhaps the largest period of growth ever known in the industry. Among those plants was the first to be constructed in the Upper Midwest – St. Louis Park, Minnesota. Built by Dyer and Kilby for the now defunct Minnesota Sugar Company, the plant had the capacity to process 350 tons of beets per day which represented an average capacity for plants constructed during that era. Records show that the St. Louis Park Plant produced sugar from beets from 1898 until 1904. It then succumbed to a fiery death in 1905. Records also indicate that the St Louis Park Plant never proved to be a successful operation. It was replaced in 1906 by a plant constructed at Chaska, 20 miles southwest of Minneapolis. The Chaska Plant was owned by the Carver County Sugar Company until 1925 when it was acquired by American Crystal Sugar Company, now headquartered at Moorhead. Although it no longer produces sugar, the 600 ton-per-day plant is still used as a sugar distribution center. Equipment for the Chaska Plant came from a defunct sugar mill at East Tawas, Michigan, not from St. Louis Park as some people speculate. Following the fire which consumed the St Louis Park Plant, all workable equipment was purchased and moved to Visalia, California where a new plant was constructed in 1906. In 1919, the St. Louis Park equipment was again relocated – this time to Hooper, Utah. There it went “on line” with other equipment designed and produced in France. In 1936, the Hooper Plant was dismantled, ending the saga of the ill-fated St. Louis Park sugar plant.